Tyrone Barnett celebrates his debut goal for Posh at Doncaster. Photo: David Lowndes. Million-pound flop Tyrone Barnett returns to Peterborough United tomorrow (December 12) admitting his time at London Road was a huge personal learning curve. Barnett cost Posh £100,000 a goal. He rescued a point with a last-gasp goal on his debut as a substitute in a Championship fixture at Doncaster, but ultimately scored just 12 times for the club following his £1.2 million move from Crawley in 2012. He made just 43 appearances for Posh before moving to Shrewsbury last season. Tyrone Barnett in action for Posh against Sheffield United. Photo: David Lowndes. Barnett promptly helped ‘the Shrews’ to promotion from League Two, but he’s been on the fringes of his new club’s squad this time around. 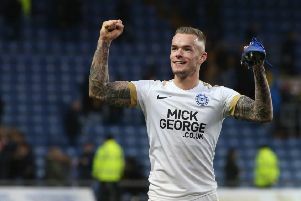 The 30-year-old former van driver expects a mixed reaction from Posh fans tomorrow and he won’t let on whether or not he intends to celebrate if he scores. “Hopefully I can play a big part in the game. I’ve got very happy memories from the way things started off there for me, but I’ve got terrible memories of the way things finished for me there. Million-pound Posh striker Tyrone Barnett can't believe he's just missed a sitter against Birmingham. Photo: David Lowndes. “It’s a long time ago now, but I’ve used it as a big learning curve in football, particularly off the field. “I think I learned more about being a professional than anywhere else really. Everything - from conducting myself in public, looking after my body to coming through a big injury, I learned a lot there. “I went there from Crawley and there was a lot of talk about it at the time because of the size of the fee. “I didn’t set the price, but it creates a lot of talk and people have expectations. “I went there when they were in the Championship, then I got injured the following season and then we got relegated. “I did my cruciate on loan at Ipswich and it was my first serious injury. “That made me pretty low. It was one of my worst times in football. I’m pleased I’ve got that under my belt now. “But I’ve got loads of happy memories from my time there as well - I could go on for days about them. “I had a successful season in League One, but then didn’t play much and was out at different clubs on loan. “The football side of things wasn’t the best for my career at the end because I wasn’t playing, but the experience was very good in terms of my development. “I try to take positives from everything and I enjoyed my time at Peterborough. “I think my reception will be a bit mixed. A lot of the fans there felt I should have been playing and a lot of them thought the opposite, so it might be a bit of both! “I talk to quite a few of them so it will be nice to see them again,” Barnett added. “A few of us play on Playstation 4 together - we all have our time beating each other! Central defender Nathaniel Knight-Percival is another former Posh man coming back to London Road tomorrow.